The VESC at the Volvo Museum in Gothenburg. On paper and on the road, the Volvo 240 is among the most reliable cars ever built. Introduced in 1974 and discontinued in 1993, it's not uncommon to this day to find a 240 with over 200k miles on the original drivetrain. In addition to reliability, the 240 was built with safety in mind and contributed to the budding of Volvo's reputation as a reliable, conscious manufacturer. But this isn't about the 240. 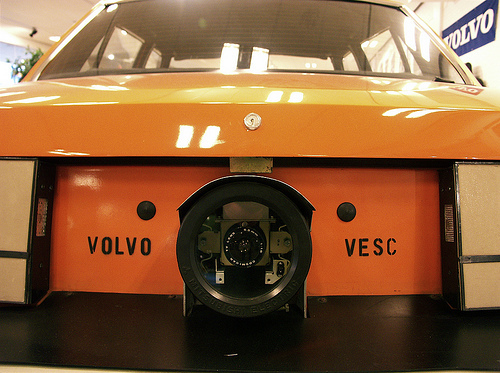 It's about the car that made it possible and set the stage for all Volvos to come. We're talking about the 240's predecessor that's often overlooked, a car that many haven't even heard of: the legendary VESC. The interior of the VESC, complete with a rear-camera screen. Yes, that's a rear-view camera, 46 years before they were legally required. We use the term "trend setter" a lot in the auto industry, but the VESC really took this one to the next level. Certain features from the VESC, such as ABS brakes and front airbags, became standard in vehicles much later. And even today, pioneering aspects of the VESC continue to be integrated into modern vehicles. Take rear view cameras, for example, which The National Highway Traffic Safety Administration will require on all automobiles by May 1, 2018. Perhaps the most innovative aspect of the VESC is its sturdy body. In fact, the front and rear sections were constructed for optimum crash absorption. Inside, the passenger compartments were secured with a thorough network of roof beams, which featured an integrated roll-over cage. The sides of the body were outfitted with tubes, which provided an extra level of protection during a side collision. And those bumpers you see sticking out? They may have given the VESC an uncharacteristic look, but they also protected the body panels from damage in impacts up to 10 mph. That might not seem like much, but that could mean the difference between a new bumper and a new set of doors in a fender bender. Under the hood, the rear engine mounts were put together so the engine would slide under the car during a frontal impact. The VESC wasn't just about safety. Its 4-cylinder fuel-injected B20 engine was developed to meet strict US exhaust emission requirements a full 2 years before they were standards. Also packed with a catalytic reactor, the VESC was the precursor to the Volvo's three-way catalytic converter with a Lambda sensor that controlled exhaust emissions. Forty years later, this technology is still widely used across the industry. The VESC's automatic seat belts. Simply put, the 240 might not have made it out of the decade, much less lasted 19 years in production, without the VESC. The styling of the VESC and 240 are similar, and many of the technical solutions introduced in the VESC were incorporated into the 240 when it debuted in 1974. This made it one of the safest and most reliable cars on the road, and definitely one for the history books.